Join Bookmans Mesa and Drag Story Hour Arizona as we join forces for an Earth Day inspired story hour full of magic, fantasy, and fun. We will be reading some of your favorite tales, interactive singing and dancing, as well as indulge in a great sustainable craft. Reading for us today are special guests Miss Felicia Minor, Mr. Freddy Prinze Charming, Miss Luna A Louvet, and Miss Miss Nature! -Julián is a Mermaid by Jessica Love. –These Bees Count by Alison Formento. Super Smash Brothers Saturday Ultimate Tournament Bookmans Entertainment Exchange Northwest 3733 W. Ina Rd. 20apr11:00 am1:00 pmSuper Smash Brothers Saturday Ultimate Tournament11:00 am - 1:00 pm Bookmans Entertainment Exchange Northwest, 3733 W. Ina Rd. We got a Switch! So let the games begin! We’ll be playing Super Smash Brothers Ultimate. Enter the arena on Saturday, April 20 from 11 am – 1 pm and win big! Sign up will begin at 10 am! Our video game tournaments are gathering steam and popularity. Play as your favorite Nintendo characters as you battle against your friends! There will be a 2nd monitor and system for Melee if you want to kick it old school on the Came cube. Our video game group is a Democratic operation and suggestions are welcome. Players may bring their own controllers and games to play as long as they are system compatible. This action-packed event is for all ages/capabilities. Email northwestevents@bookmans.com for more information. Join Bookmans Flagstaff for Earth Day 2019, Saturday, April 20th at Bushmaster Park. Celebrate our planet and learn what you can do to help her heal and protect our environment with the City of Flagstaff. Music, vendors, and workshops with some of Flagstaff most environmentally friendly organizations and businesses. Join Bookmans Flag at the community cleanup prior to the event. Learn more about Earth Day and the community clean up here. Bookmans Flag will be hosting a special Read To Me Story Time on April 19th featuring Albert Squirrel in celebration of Earth Day and in partnership with the City of Flagstaff Sustainability. To learn more click here. 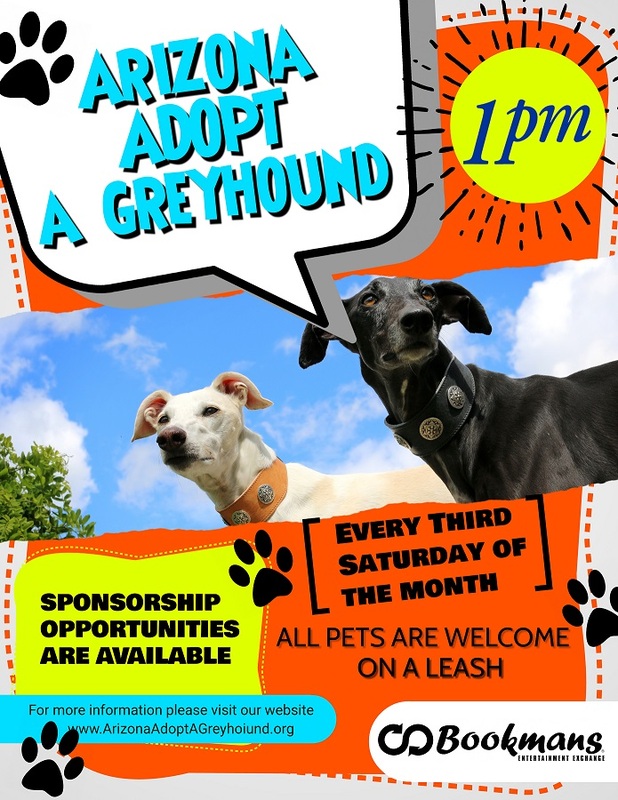 20apr11:00 am3:00 pmMeet Your New Best Friend Adoption Day11:00 am - 3:00 pm Bookmans Entertainment Exchange East, 6230 E. Speedway Blvd. Acoustic Salon Showcase Bookmans Entertainment Exchange Midtown 3330 E. Speedway Blvd. 20apr1:00 pm2:30 pmAcoustic Salon Showcase1:00 pm - 2:30 pm Bookmans Entertainment Exchange Midtown, 3330 E. Speedway Blvd. 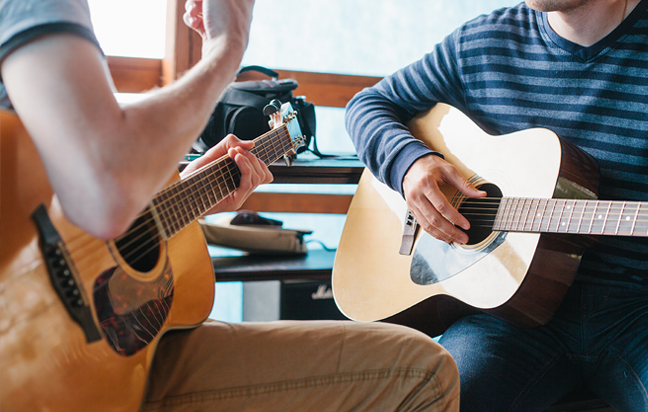 Join us every 1st and 3rd Saturday at Bookmans Midtown to listen to an acoustic performance from local musicians like Positively 4th Avenue as they perform covers of popular songs. 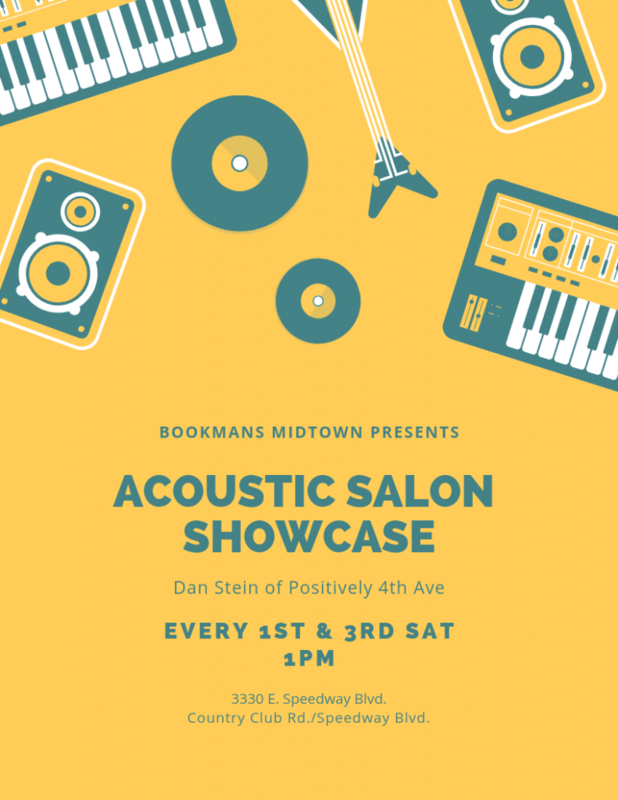 Join us every 1st and 3rd Saturday at Bookmans Midtown to listen to an acoustic performance from local musicians like Positively 4th Avenue as they perform covers of popular songs. It’s relaxing, easy to sing along with, and an excellent way to enhance your browsing experience while exploring local performers. Arizona Adopt A Greyhound is proud to be one of the nation’s largest Greyhound Adoption agencies. A small dedicated staff and lots of hard-working volunteers have made AAGI the successful program it still is today. We keep all of our dogs at this time in foster homes. And we continue to be at events throughout the year so people can see what wonderful pets these great dogs make. We have former kennel owners who would still like us to take their dogs, plus the ever returning stream of dogs coming back for divorces, deaths, moves or finances. There will continue to be dogs available for adoption!! Mario Kart On Nintendo Wii Tournament Bookmans Entertainment Exchange Flagstaff 1520 S Riordan Ranch St.
20apr3:00 pm5:00 pmMario Kart On Nintendo Wii Tournament3:00 pm - 5:00 pm Bookmans Entertainment Exchange Flagstaff, 1520 S Riordan Ranch St.
Once again Bookmans Flagstaff and Kikori Con are partnering up another video game tournament and this time we're going old school. Rev your engines for Mario Kart on Nintendo Wii. Once again Bookmans Flagstaff and Kikori Con are partnering up another video game tournament and this time we’re going old school. Rev your engines for Mario Kart on Nintendo Wii. Score Bookmans gift cards and some sweet swag when you came 1st, 2nd, or 3rd place. Sign-ups start at 3 pm day of the tournament. Video game Tournaments take place every other month at Bookmans Flagstaff. Games will vary each month based on audience preference, so if you have a game that you’ve mastered and want to play here at Bookmans, make sure to either email us at flagevents@bookmans.com or we’ll take suggestions at each tournament. Check back for each month’s game and battle it out for prizes from Bookmans and Kikori-Con. Sign-ups start at 3 pm with the tournament kicking off at 3:15 Pm. We hope to see you there! The 32nd Annual Reno Gannon Memorial Jell-O Wrestling Extravaganza and Benefit Auction will be held on Saturday, April 20, 2019, on 4th Avenue. Teams of wrestlers raise funds to wrestle in a pit of Jell-O, often with extraordinary costumes and characters. 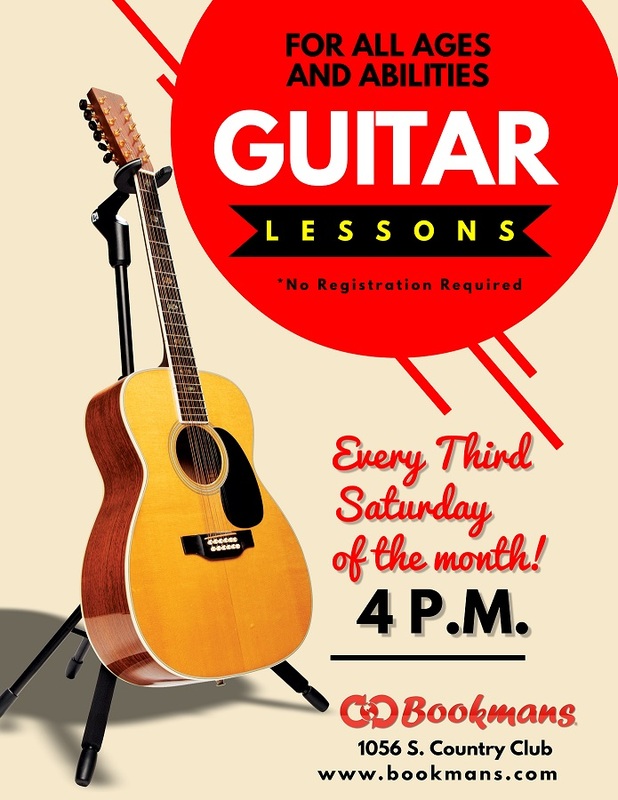 Bookmans will be present with Bookman ready to amp up the crowd! Participate in a game and win Bookmans prizes and merchandise! Doing good was never this much fun! Writers Unite at Bookmans Midtown Bookmans Entertainment Exchange Midtown 3330 E. Speedway Blvd. 20apr5:00 pm7:00 pmWriters Unite at Bookmans Midtown5:00 pm - 7:00 pm Bookmans Entertainment Exchange Midtown, 3330 E. Speedway Blvd. Are you still working on that novel from November? No worries, we’re keeping the NaNoWriMo momentum going every 1st and 3rd Saturday at Bookmans Midtown! Come continue that novel you were working on or start a new project! You didn’t participate in NaNoWriMo 2018? No worries, get started on your next novel or work on your passion project with other inspiring writers!